Speedlink likely isn't the first name that springs to mind when you're shopping for a mechanical gaming keyboard here in the UK, but the German outfit has become a well-known brand on the continent having sold over 15 million game controllers since the company was founded in 1998. 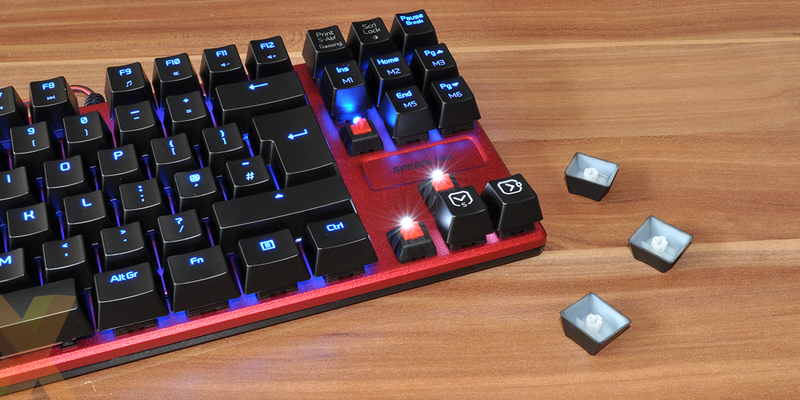 Hoping to broaden its appeal, Speedlink is introducing the Ultor mechanical gaming keyboard to British shores. Priced at £70 and employing Kaihua Kailh switches, Ultor offers something different to the numerous Cherry-based options on the market and we've spent the last couple of weeks getting acquainted. Measuring 350mm (W) x 122mm (D) x 33mm (H) in size and weighing in at 680g, Ultor is a short-but-stout solution aimed specifically at gamers who prefer a tenkeyless layout. I always find it tricky to adjust to a keyboard without a numpad, but if you're going to spend most of your time gaming, there's real benefit in having the mouse hand closer by. Build quality and overall rigidity is good, with Speedlink opting for the favoured combination of an aluminium top covering a plastic base. A robust pairing that presents no obvious squeaks nor rattles, though there are going to be question marks concerning the colour scheme. 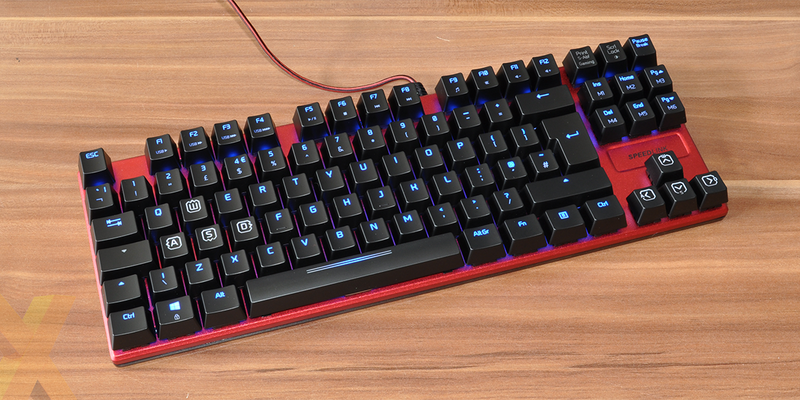 The bright-red aluminium layer contrasts reasonably well with the black keys and base, but the blue LED backlight is somewhat jarring, and in contrast to the growing number of RGB solutions, the colour of the LEDs on offer here can't be changed. Flip over and Ultor's simplicity continues. There are no cable-routing paths, let alone anything as fancy as audio passthrough, while the sheathed, off-centre USB connection cable measures 1.7 metres in length. 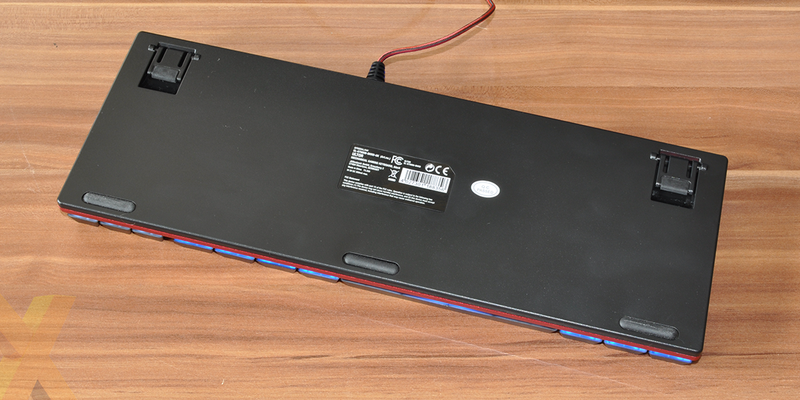 A trio of rubber feet along the keyboard's front edge help keep the unit planted, however the rubber tips on the rear stands don't make good contact unless the stands are deployed. Ultor's external design is free of frills, yet all the gaming features you'd expect are present and accounted for. These include N-key rollover, onboard profile storage, configurable polling rates and key response times (up to 1,000Hz and 16ms, respectively), as well as Windows key lock and six dedicated macro keys. The majority of the keys are sat atop a blue LED, however WASD, the arrow keys and Print Screen/Gaming are backlit in white to stand out from the crowd. Do bear in mind that none of the LEDs are able to change colour - so you can't have all the keys matched-up - and Scroll Lock, which acts as an LED brightness shortcut, isn't backlit at all. A stylised font helps gives the keycaps a gaming look, yet while the lettering is positioned higher-up for better alignment with the underlying LEDs, the backlight isn't perfectly even. Keys with two rows of lettering, in particular, appear dim on the bottom half. Premium keyboards get around this limitation with surface-mounted LEDs and translucent keycaps, but Speedlink plays it safe with LEDs mounted above the key switch.